Alexandria Bay, Queensland, Australia - How to get there. 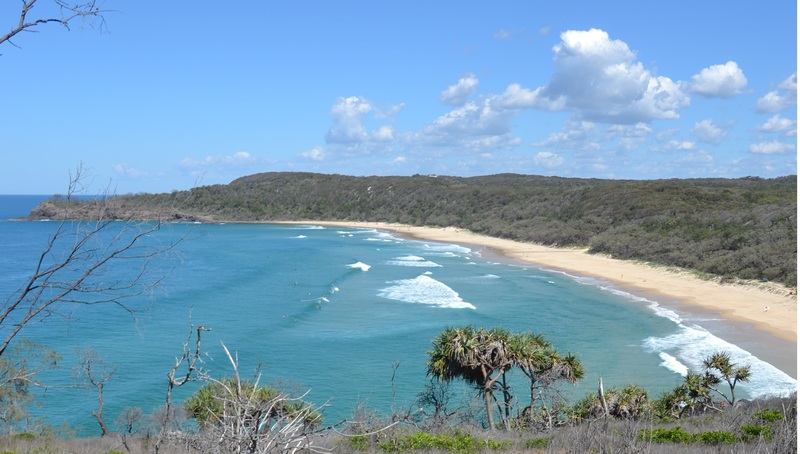 The beach is in the Noosa National Park on the Sunshine Coast of Queensland, north of Brisbane. The park itself is very well managed. The park has 5 numbered paths that are well signposted and you can easily find your way to the beach at Alexandria Bay. 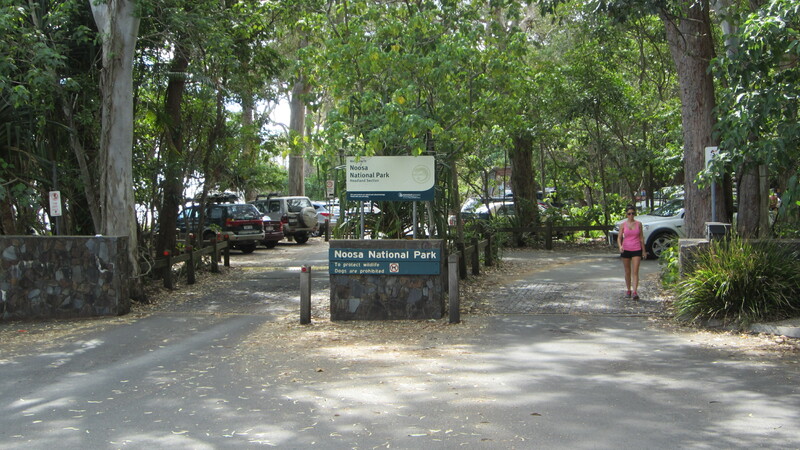 The park is a great place to walk and explore in its own right with areas of rainforest, woodlands, open forest and wallum heathland and it protects several species of bird and you may find the odd koala. You will need to walk a couple of kilometres so some level of fitness is necessary. Option 1. Make your way to the coastal holiday township of Noosa. It’s a large well serviced place with everything you will need, including supermarkets and restaurants. Accommodation can be a touch more expensive during holiday times, ie school holidays. Noosa does become very busy during these times. The main entrance for the National Park is easily found at the end of Park Road which continues past the round-a-bout from the town’s main street (Hastings Street). There is a car park at the park’s entrance, however, it might be a bit busy at times and parking on the street is limited to 2 hours. The park entrance is a 10 minute walk from town anyway. The park entrance has a kiosk, information booth, toilets and a barbeque picnic area. There a quite a few signs that display information about the park and the walking trails. The easiest path is the coastal walk or the blue number 4 path, it’s also the most scenic with spectacular views and worth the walk for the view alone. It follows the coast and passes small bays and minor beaches. Its about a 3 km walk, that really doesn’t seem that far and its fairy easy going. You’re unlikely to be alone as its very busy at times with people heading in both directions. 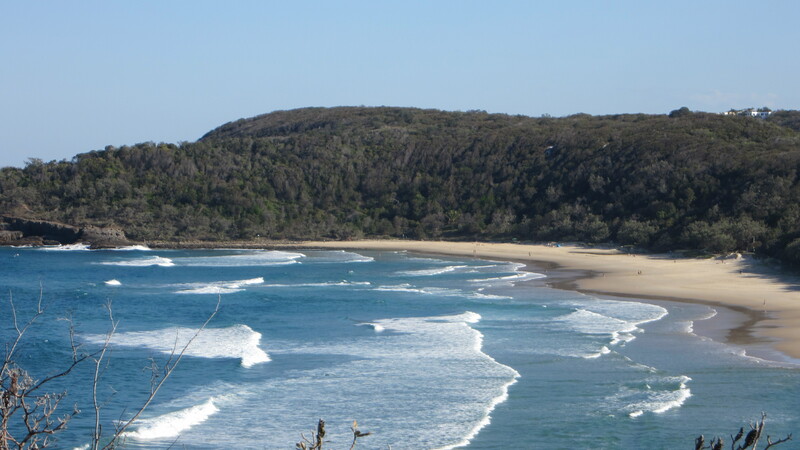 There is a ‘short cut’ that avoids one main headland onto the ‘Tanglewood track’ (Path 2) that cuts a bit of time but you do miss out on the headland and a great view of the beach looking south. There are a couple of other options that go through the park and are a great bush walk, you’re best to check the maps and decide the best for you. These tracks aren’t as busy as the coastal track. Whichever track you take a suitable footwear will be a good choice. These tracks will bring you to the northern end of the beach. Although the whole beach is considered to be a nudist beach, most people do head to the southern end. Option 2. – Sunshine Beach entrance. 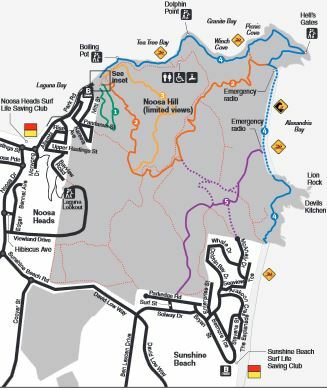 Alternatively, park as close as you can to the end of McAnally Drive or Solway Drive area, and enter the National Park using a path that will bring you to Path 5 or the Alexandria Bay track. Turn right on this path and you’ll end up at the southern end of the beach. Parking in this area is limited and it’s a residential area so you may end up parking quite a bit of a walk from the entrance. No matter which way you take to get there – you will be delighted with the effort.